The Book of Lamentations (Hebrew מגילת איכה) is a book of the Jewish Tanakh and the Christian Old Testament. As suggested by its title, the book recounts the tragedies and horrors experienced by the Judean people as they were exiled by the Babylonians and the first Temple of Jerusalem was destroyed. While the text is often credited to the Prophet Jeremiah, modern biblical scholarship has disproved this attribution, instead suggesting that the received version is an amalgamation of various poems by different authors. This contention is supported by the fact that the book as received consists of five separate poems, each of which exists as a discrete unit. The text is traditionally read by Jewish people on Tisha B'Av, a feast day that bewails the destruction of the Temple in Jerusalem. It is also used as part of Christian Tenebrae services, which are celebrated during Lent. Given that the book itself has no formal title in the original scrolls, it is customarily referred to by its first word, Ekhah, which is "an exclamatory particle meaning 'How!'" 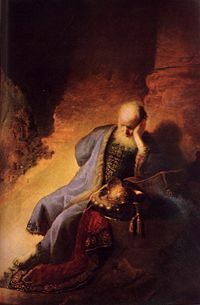 The Septuagint, following the later Rabbinic usage, adopted the name rendered "Lamentations" (Greek threnoi / Hebrew qinoth, "dirges"), to denote the character of the book, in which the prophet mourns the desolations brought on Jerusalem and the Holy Land by the Babylonians in 586 B.C.E. This name has been retained throughout the various subsequent translations of the text, though some versions mistakenly append the prophet Jeremiah's name to it (a misattribution that is discussed below). According to tradition, authorship is assigned to the Prophet Jeremiah, who was a court official during the conquest of Jerusalem by Nebuchadnezzar, and, resultantly was a first-hand witness of the destruction of the First Temple and the capture of King Jehoiachin. Indeed, folk wisdom suggests that Jeremiah retired to a cavern outside the Damascus gate, where he wrote this book. While some scholars agree with this traditional attribution, it has not been borne out by modern scholarship. Likewise, even the suggestion that book is the product of a single author, as argued by Renkema, are in the minority. Jeremiah had condemned the Temple as "a den of robbers" (7:11), while throughout Lamentations, the Temple is the sacred seat of God (e.g., 2:1, 2:6 and passim), with not blot upon its escutcheon. While the prophet was vigorously opposed to any alliance with Egypt, the poet treats the invoking of aid from Egypt favorably, or at least neutrally (5:6). The adulatory references to the King as "the breath of our nostrils, the anointed of God" (4:20), stands in stark contrast to Jeremiah's condemnation of the royal house (chap. 22). This is not to mention the acrostic style adopted by the poetic author of Lamentations (discussed below), which is a literary flourish that is entirely absent from Jeremiah's output. In fact, sufficient stylistic differences exist within the text to suggest that it is, itself, a redacted volume. When these structural and stylistic facts are coupled with two notable cultural issues (namely, that writing eponymous texts credited to famous authors was a common practice and that a well-established tradition of Mesopotamian "city laments" was already in existence), it seems likely that the problem of authorship will remain insoluble. While some commentators argue for an ahistorical interpretation of the text, the vast majority see Lamentations as a description of events immediately following the destruction of Jerusalem in 586 B.C.E. Indeed, many particular episodes described in the lament are borne out by the historical narrative in 2 Kings concerning the fall of Jerusalem: Jerusalem lying in ruins (Lamentations 2:2 / 2 Kings 25:9), enemies entering the city (Lamentations 4:12 / 2 Kings 24:11), the exile of the Judean people (Lamentations 1:3 / 2 Kings 24:14) and the plundering of the holy sanctuary (Lamentations 1:10 / 2 Kings 24:13). Further, even though Babylon is never mentioned by name in Lamentations, this could simply be making the point that the judgment comes from God, which transforms the invaders into a simple instrument of His will. Given the near universal acceptance of the multiple-author hypothesis, it is not possible to provide a definitive date for the collected writings preserved in Lamentations. However, it (or at least part of it) was probably composed soon after 586 B.C.E. To this end, Kraus argues that "the whole song stands so near the events that one feels everywhere as if the terrible pictures of the destruction stand still immediately before the eyes of the one lamenting." Others suggest that the different chapters (each of which can be seen as a discrete unit) can be tentatively traced to different era. One such timeline places Chapter 2 and 4, which are the "rawest" in their emotional pain, closest to the events described therein, with Chapter 1 following fairly shortly thereafter, Chapter 5 emerging some time before the temple had been rebuilt (perhaps around 530 B.C.E. ), and Chapter 3 (with its personal but highly general content) being written "almost any time in the postexilic period." From a completely different perspective, Houk argues, using a statistical analysis of word choices in the text, that the book was composed over an extended period of time by "temple-singers-in-training," who were building upon oral tales of the exile in a gradual manner: "Perhaps Lamentations is a collection of practice laments composed by temple singers, or other poets, each with a different assignment, adding on lines to the growing acrostics." If this is the case, the possibility of definitively dating the text becomes rather bleak indeed. "Jeremiah Lamenting the Destruction of Jerusalem" by Rembrandt Harmenszoon van Rijn. The book consists of five separate poems, each of which possess its own particular style, focus and content. Despite this breadth, they do share a common core, which is their united attempt to cast the dreadful events of the invasion of Jerusalem and the exile of the Judean people into a meaningful framework. tears are upon her cheeks. to those I cannot withstand. for the Daughter of Judah. "This reflects the fundamental theological presupposition of Hebrew belief: the Lord is the absolute ruler over the universe and yet wishes to be the God of Israel. ... The recommendation to bear suffering patiently has, of course, nothing to do with resignation, but rests upon the unshakable theological assumption of God's benevolence and mercy. Consequently, a man of true faith must have sufficient strength and hope even when God allows his enemy to strike him mercilessly." Chapter 4 returns to the form of the first two chapters, but does so in a slightly different manner. Specifically, it uses various stylized comparisons to explore the themes addressed above, "which here [operate] as a powerful distancing device, in contrast to the metaphors of the first two chapters." However, "alongside these rhetorical devices that idealize and divert is a simple account of the fall of the city." like men who are blind. The first four poems (chapters) utilize the poetic technique of acrostics, beginning each verse with successive letters of the Hebrew alphabet (a technique that is also attested to in Psalms 25, 34, 37, and 119). As such, the first, second, and fourth chapters each have twenty-two verses, corresponding to the number of the letters in the Hebrew alphabet. The third has sixty-six verses, allowing each three successive verses begin with the same letter. Further, these initial four chapters all follow a rigid metrical structure, which is consistent enough that it has come to be known as the "Lament" (qinah) metre (regardless of where it is found). The fifth chapter does not follow either the metre or structure of the previous four, though its twenty-two verses imply that it could have been an unfinished acrostic. They applied the literary form of parallel acrostics as a visualization of the responsive coherence between the (strophes of the) poems. The strophes—marked by the same letters of the alphabet—form song responsions, that is to say: in one way or another the identical letter strophes form on the same (letter) level external parallelisms, identical, additional or antithetical in content. Once again, the impassable gulf of history makes it impossible to truly gauge which of these approaches (if any) are correct. On the ninth day (Tisha) of the Jewish month of Av, Jewish people "celebrate" a festival of remembrance, which has been called the "saddest day in Jewish history". It is dedicated to the memories of the various pains and losses that the Jewish community has experienced through history (both ancient (the destruction of the Temple) and modern (the Holocaust)). As part of the Tisha B'av service, the scroll of Eichah (Lamentations) is read in synagogue during the evening services. In addition, most of the morning is spent reading kinoth ("dirges"), most bewailing the loss of the Temples and the subsequent persecutions, but many others referring to post-exile disasters. Likewise, the High Church Tenebrae mass celebrated during Lent also uses readings from the Book of Lamentations to highlight the pain of the Passion. ↑ 1.0 1.1 Theophile J. Meek, Introduction to and Exgesis of "The Book of Lamentations" in The Interpreter's Bible (Vol. VI), edited by George Arther Buttrick, (New York: Abingdon Press, 1956), 3. ↑ Such as Wilhelm Rudolph in Die Klaglieder, referenced in Meek, 5; Dobbs-Allsopp, 5 (quoted below). ↑ Houk summarizes Renkmena's position as follows: "Lamentations is a unified literary creation from the onset, perhaps by one temple singer, but 'elaborated by more than one', a 'collective work of art'. He enumerates many inclusions and responses which link the poems as a synchronic 'product of the guild'. In an earlier work, Renkema (1988: 391) allows for multiple poets contributing to Lamentations but who 'would have done so at the same time, in careful teamwork' (113). See also F. W. Dobbs-Allsopp, who argues that "the widely observed unity of form and point of view... and general resemblance in linguistic detail throughout the sequence are broadly suggestive of the work of a single author" (5). ↑ This history, which can be definitively traced back to the Talmud (and tentatively back as far as the composition of the Book of Chronicles), is summarized in Gordis, 269. ↑ Lachs, 47-48; Gordis, 271-272; Meek, 5. However, this perspective is argued against by William Lanahan, who suggests that each of these apparent voices are only personae that were deliberately adopted by the author for literary effect (42). ↑ However, it should be noted that some authors deny any parallel between the Sumerian and Israelite laments. See, for example, McDaniel, who concludes his paper with the following cogent position: "It seems best to abandon any claim of literary dependence or influence of the Sumerian lamentations on the biblical Lamentations. At most the indebtedness would be the idea of a lamentation over a beloved city. But since there is such a natural corollary to individual and collective lamentations or funeral laments, indebtedness may properly be discarded" (209). ↑ Provan, 138. See also Lachs' view on the provenance of Book V in the text. ↑ Brevard S. Childs, Introduction to the Old Testament as Scripture (London: SCM, 1979), 593; Meek, 4-5; Landy, 329-332; Gordis, 272. ↑ Conversely, Landy notes that this rhetorical silence could emerge from the "political expedience" necessary among "people living under occupation" (333). ↑ Cited in Provan, 133. ↑ 13.0 13.1 Meek, 5. ↑ Lamentations 1: 1-2 (NIV). ↑ Lamentations 1: 14-15 (NIV). ↑ Alter and Kermode, "Glossary," 670. ↑ Lamentations 2: 5-7 (NIV). ↑ Lamentations 2: 20-21 (NIV). ↑ Lamentations 3: 17-22 (NIV). ↑ 22.0 22.1 22.2 Landy, 332. ↑ Lamentations 4: 12-14 (NIV). ↑ Lamentations 5: 19-22 (NIV). ↑ 26.0 26.1 Meek, 3. ↑ Meek, 4; Houk, 124 (who makes a case for Chapter 5 as an implicit (or unfinished) acrostic). ↑ Joseph Telushkin, Jewish Literacy: The Most Important Things to Know About the Jewish Religion, Its People and Its History (William Morrow & Co, 1991, ISBN 0-688-08506-7), 656. Buttrick, George Arthur (Commentary Editor) et al. The Interpreter's Bible: the Holy Scriptures in the King James and Revised standard versions with general articles and introduction, exegesis, exposition for each book of the Bible. New York: Abingdon-Cokesbury Press, 1951-57. Gordis, Robert. "Commentary on the Text of Lamentations." The Jewish Quarterly Review (New Series), Vol. 58, No. 1 (July 1967), 14-33. Houk, Cornelius. "Multiple Poets in Lamentations." Journal for the Study of the Old Testament 30.1 (2005), 111-125. Krašovec, Jože. "The Source of Hope in the Book of Lamentations." Vetus Testamentum Vol. 42, Fasc. 2 (April 1992), 223-233. Lachs, Samuel Tobias. "The Date of Lamentations V." The Jewish Quarterly Review (New Series), Vol. 57, No. 1 (July 1966), 46-56. Lanahan, William F. "The Speaking Voice in the Book of Lamentations." Journal of Biblical Literature Vol. 93, No. 1 (March 1974), 41-49. McDaniel Thomas F. "The Alleged Sumerian Influence upon Lamentations." Vetus Testamentum Vol. 18, Fasc. 2 (April 1968), 198-209. Provan, Iain W. "Reading Texts Against an Historical Background: The Case of Lamentations," Scandinavian Journal of the Old Testament 1990 (1), 138. Renkma, L. "The Meaning of the Parallel Acrostics in Lamentations." Vetus Testamentum XLV 3 (1995). 379-383. History of "Lamentations, Book of"
This page was last modified on 20 June 2018, at 14:47.